Hello ... Hello ... my old friends ... It's great to see you once again! Regular visitors to ELO Beatles Forever [ELOBF] will know that it is a great pleasure of mine to also occasionally introduce and recommend talented local artistes to you too. 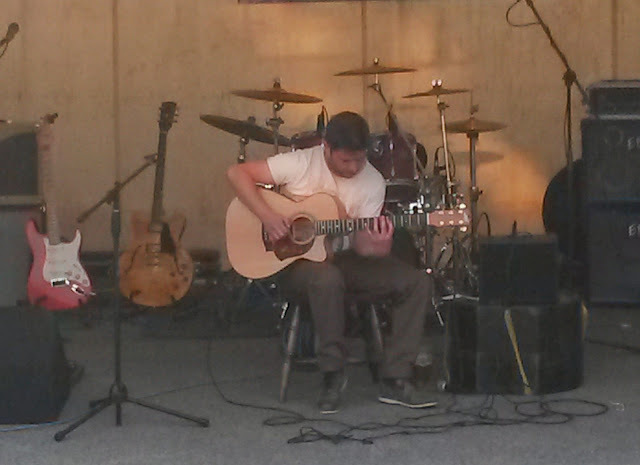 One of the plus points of last weeks Brewood Music Festival was to witness an astounding exhibition of fingerstyle guitar craft by Wolverhampton's very own Pete Kent in support of The Trevor Burton Band. His performance was so good that I got hold of a copy of Pete's debut album "Sands Of Time" [Revolver Music #REVXD2016] for a listen. ELO Beatles Forever [ELOBF] recommends "Sands Of Time" by Pete Kent to those enlightened folks who enjoy the music of ELO, Jeff Lynne, Roy Wood, The Move, The Idle Race, 'Brum Beat', The Beatles and related artistes.